When you notch your program’s biggest victory in literally decades, as Syracuse did by knocking off #2 Clemson on Friday night, it takes a well-rounded effort with offense, defense, and special teams all helping out. The Orange have been getting significant contributions for large parts of the season from each phase with some of those facets becoming more notable as the season has progressed. The clock-killing part of the offense is a feature, not a bug. 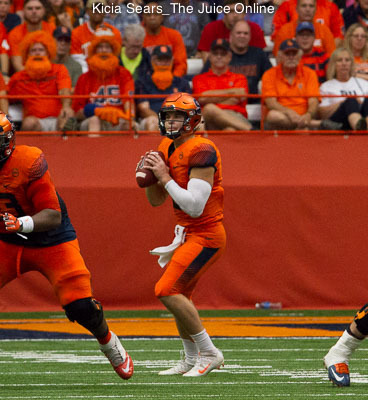 Since Dino Babers arrived at Syracuse, the run game has not been consistently productive. At first glance, that makes sense, as the expectation was for the offense to be a fast-paced aerial attack that stresses opposing defenses and rolls off big plays. Only the “stresses defenses” part of that description has been the case, but it has shown in SU’s two recent victories. In wins over Pitt and Clemson, the Orange have taken possession of the ball late and eaten up over six minutes of clock, ending the latter game and all but ending the former. How? By keeping the illusion of still going at their high-paced tempo, but actually bleeding the clock and grinding out first downs on the ground. When Syracuse looks to run out the clock, they still act the same on offense as they do the rest of the game. The ballcarrier tosses the ball to an official at the middle of the field to quickly spot the ball and the players hustle to their directed spots at the line of scrimmage, as if to snap the ball quickly. Then, the players back off a step and turn to the sideline for the playcall. Meanwhile, the clock runs and runs. Meanwhile, the opponent cannot risk attempting to substitute players, as the risk of the Orange snapping the ball and drawing a penalty for too many men on the field looms. So, what Dino Babers is saying to his counterpart is that the 11 players starting the drive will be out there the whole drive or it will cost five yards or a time out to send in reinforcements… and those reinforcements will be boarding that same boat. moved the chains four times. Prior to getting the ball back with 52 seconds left, Pitt had 54 offensive snaps. Against Clemson, the Orange took over possession with 6:10 on the clock and never let the Tigers touch the ball again. 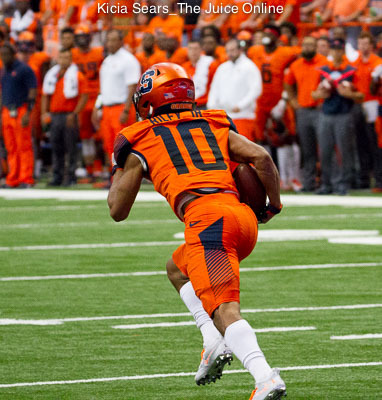 Of the nine plays SU ran before downing out the clock, seven were true run plays and an eighth went on the stat sheet as a run when Dungey was sacked when a shovel pass was thwarted by defensive penetration. Those seven runs totaled 30 yards and two of the three first downs the Orange generated on that final drive. Prior to that drive, Clemson had defended 71 plays. Their offense ran 57 total on the game. Is it any wonder the Orange were able to run out the clock? The defense is unspectacular, except on third downs. The Syracuse defense does not force a lot of turnovers. It is tied with a handful of other teams with only four interceptions and four fumble recoveries in seven games. Its eight turnovers rank them 81st in the nation along with 13 other teams, many of whom have played fewer games than SU’s seven. The Orange defense also does not pile up quarterback sacks, having amassed ten in seven games, good for 103rd in the country with 1.43 sacks per outing. They are also 72nd in tackles for loss. They are, however, pretty fair at limiting their foes on a play-per-play basis. SU ranks 49th nationally in yards allowed per rush and 54th in yards allowed per pass attempt. Neither is spectacular, but they do a good job of forcing an offense to make plays to extend drives. That’s where the third down defense comes in. Syracuse is simply excellent on third down, allowing opponents to convert 23.9 percent of their attempts, good for third in the nation. The average FBS team allows opponents to convert around 38 percent of third downs. As a result, the Orange have forced seven punts per game, good for 11th in the country. Special teams have quietly been a major contributor. Speaking of punts, Sterling Hofrichter stands 29th in the country in gross punting average, but he and his friends on the punt coverage unit are doing an even better than that suggests, standing 12th in net punting average. Half of Hofrichter’s 34 punts have resulted in a fair catch. Of the remaining 17 punts, three have been returned for a total of one yard. Three punt returns, one yard. Even though Cole Murphy’s penalties for kicking off out of bounds are troubling (he leads the country with five), his other kickoff stats are pretty impressive. Murphy is 13th in yards per kickoff and has forced touchbacks over half the time. Most notably, Murphy boomed all six kickoffs against Pitt for touchbacks. Why is that notable? Panther kick returner Quadree Henderson has four career kickoff returns for touchdowns and ripped SU last season for 257 all-purpose yards, so keeping the ball out of his hands was a clear priority. Murphy is also 12-of-14 on field goals this season, on pace for his best season at Syracuse, as well as 23-of-24 extra points.